The Peace Rose, the most famous rose of Meilland International, appears on a stamp of the U.S. Postal Service! The history of Meilland International is associated with that of several families: Rambaux, Dubreuil, Meilland and Richardier. These truly enthusiastic families whose stories intermingle have literally written history through their roses. 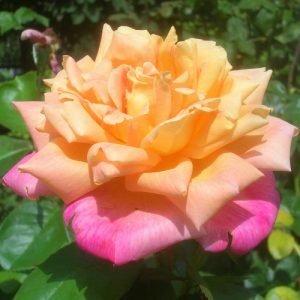 Although the romance between roses and these families goes back to the 1850s, Francis Meilland is recognized as the official founder of the company created in the 1940s. Francis Meilland is also the creator of the Peace Rose. This iconic rose, created in 1942 and recipient of several awards, appears on the new stamp of the USPS since last year. Today, Meilland International is one of the world’s leading companies in the creation and production of roses. It is managed by Matthias Meilland, grandson of Francis Meilland.